I have been on the lookout for white pumpkins but sadly I just cannot seem to find any around where we live. At least not yet, anyway. So last weekend I found myself painting a normal orange pumpkin white. Yes, I do sometimes wonder what on earth I’m doing with my life! Haha. 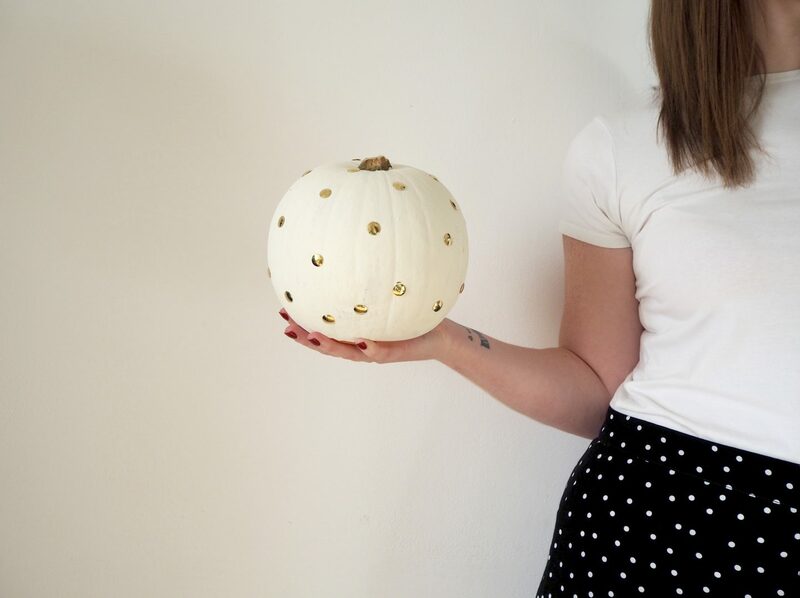 I then decorated it with gold spots, which was super easy to do and you’ll find out exactly how I did it later on in this post. You’ll need to start off by giving your pumpkin a good wash. Some of them can be really grubby, especially if you’ve picked yours from a pumpkin patch. Make sure it’s nice and clean or your white paint won’t look very white! Next it’s time to paint your pumpkin. I wouldn’t worry too much about the sort of paint you use as it’s just for decoration so doesn’t need to be hard-wearing. I had some left over white emulsion from the last time we decorated so I just used that and it worked perfectly. I gave mine two coats, but it completely depends on the type of paint you use. Once one side is dry you can turn your pumpkin over and paint the bottom if you want to. I didn’t bother doing this as the bottom isn’t visible anyway. When your pumpkin is completely dry, it’s time to decorate! I knew I wanted to add gold spots but thought that stickers probably wouldn’t stay on, and painting the spots on by hand would be tricky and time consuming. So, my husband suggested using drawing pins instead, and what a clever idea that was! I think it looks great and don’t think you’d even guess they were pins. What do you think? Let me know if you give this a try, I’d love to know how yours turns out.